When their parents disappear, twins Marty and Grace, 13, are taken in by their Uncle Travis, who searches the world for supposedly mythical creatures. After a parachute fall from an airplane, the kids find themselves in the middle of the Congo, where a surviving dinosaur may still exist. While their conservationist uncle tries to rescue the children, an evil cryptid hunter who kills species rather than saving them pursues the creature. Marty and Grace each have distinct, if not terribly complex personalities, and their adventures are quite absorbing. The first part of the story moves fairly slowly as the characters and the concept of cryptozoology are introduced. Once the twins hit the jungle, though, things get exciting. Along with the atmospheric setting, narrow escapes, and ruthless villains, a couple of neat personal revelations are woven into the tale, affecting nearly everybody involved. Both kids show courage and ingenuity as they try to survive the wild and avoid being captured. Marty’s photographic memory provides a vehicle for presenting many facts about the environment without detracting from the tale. Grace is more introverted as she conquers her fears and discovers a life-changing revelation about her past. With the intriguing plot and plenty of well-paced action, this novel has fine booktalk potential and makes a good choice for adventure fans. Great book and starter to the seires. Thank you for saving my boring days in class. I just started reading Chupacabra, is Tentacle or Cryptid Hunters the first book? Is there a specific order i should have read these books? What book came first? First, I want to thank you for the absolute delight that my son has experienced from reading your books. He truly loves them….which obviously makes his father very happy. Second, he is wondering (I am asking on his behalf) if you have sold the movie rights to any of the Cryptid Hunter books. He is depserate to see the stories played out on the big screen. Thanks again for giving him such a great reading experience. hi can you give me a little about this book for a report i need to do please just main facts! Amazing! I’ve read the whole series and gotten my Grandma and Aunt into a book club with me JUST FOR Roland Smith books. Hope to see more amazing books like this! Maybe make a movie/movies for this series? Thanks! I hope you and your aunt and your grandmother enjoy my other books! 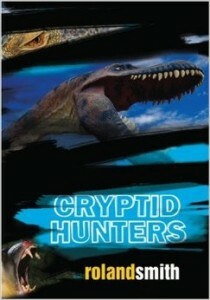 Cryptid Hunters has been optioned a couple of times, but no takers as of yet. Are you going to make a new cryptid hunters book after mutation? Sorry, the first cryptid hunter book is not in a kindle format. Different publisher than the next three. Sorry, Mutation is the last oft he series.